When I was about 3 months postpartum with my daughter we went out for Sunday brunch in Malibu. I remember feeling a little frazzled that day, still getting a handle on packing a bag for two kids instead of one, and hoping I had remembered diapers. We walked up to the restaurant, and by this point I was covered in baby spit up and lugging Esme’s car seat with her in it because she fell asleep on the drive over. Sweaty and chasing after my 3 year old, I gathered my things and was about walk to our table when I saw this glamorous blonde bombshell walking in the door with the two most gorgeous boys (also super stylish by the way) in tow. 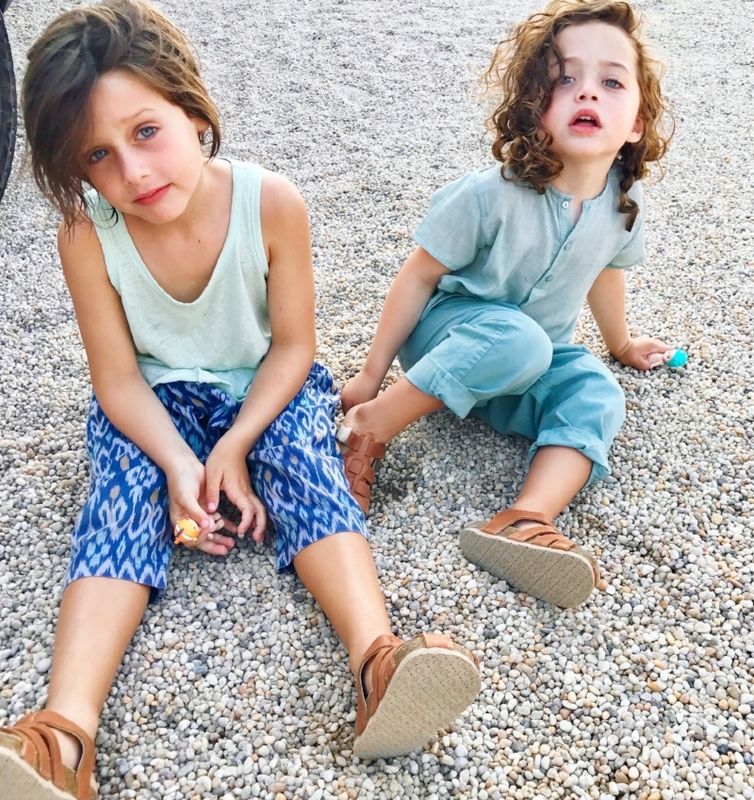 She looked like she was floating in her flowy dress and high heels, and I remembered wondering if I would ever have the wherewithal to put on shoes other than sneakers or sandals or wear matching socks again now that I had two kids. She turned to me and asked, “Are you one of the Zen Mamas?” I’m sure my mouth hit the floor as our site had only launched a few months before and I knew this was Rachel Zoe because I had followed her for years as a stylist and designer, and I had seen her just recently raising money for a charity we both love: Baby2baby. I’m sure I giggled or tripped over my next cluster of words as I was excited to meet her, and so honored that she followed our site and was a part of our community. Who's in your family? Ages? Names? Rodger and I have 2 boys - Skyler is almost 7 and Kaius is 4. It was honestly one of the hardest decisions because it is so permanent and I only ever had girls names picked out! With both of my boys, I had chosen different names up until the day before they were born and now I can't imagine anything else...it's like they naturally become their name. I knew I wanted Skyler to be named after my Great Aunt Sylvia and my Mother in law Marilyn, both of whom passed away while I was first pregnant. Also, I have always taken so much inspiration in my work and life from nature. I remember a moment when I was pregnant looking up at the sky and feeling very serene and at peace and thought I should name my son Sky, which eventually became Skyler. I wanted a name that seemed like forever and with no end. Then Sky came out with these huge blue eyes, and I knew it was right. When I was pregnant with Kaius, I again wanted to pick a name that was unique, that I felt a deep connection to, was compatible with Sky, and also had no beginning or end. I always loved the name Kai which I knew meant ocean or sea and went further to find Caius which means someone who brings joy to all they meet and that is exactly who Kaius is! I used a K for Kaius so people would pronounce it properly. I now have the sky and ocean which are my two favorites things both with eyes to match! Rodger and I are also huge classic rock fans, so Skyler's middle name is Morrison for Jim Morrison, and Kaius' middle name is Jagger for Mick Jagger. Between being a mother, The Rachel Zoe Project, the Zoe Report, and your clothing line you have A LOT going on! What helps you stay sane and find balance? Every day is a constant struggle to balance my work and home life. Every day is different and I'm still learning, but always remember to breathe. Seeing my children always brings a sense of calm and relief no matter what kind of day I'm having. What keeps me sane is putting my kids to sleep every night and hearing all about their day...such an escape from my daily insanity! Where do you find inspiration for your clothing line? I find inspiration in so much. I have always had a strong creative connection to nature and wildlife. My boys are obsessed with animals, so I find that is always somehow directing my aesthetic, as well as my travels - whether in Europe, the Colorado mountains or St. Barths. I'm also continually thinking about the strong and amazing women in my life; what they need and what they would feel beautiful in. It's always so rewarding when these women who have inspired my designs bring the clothes to life... It never gets old for me. Also, the 60's and 70's fashion decades and the icons from that time period will always infuse any collection I design. The effortless glamour of Brigitte Bardot and Jane Birkin will always inspire me. How do you stay grounded while being inundated with all things Hollywood? I feel like I have been in this business for a long time, and I've learned over time that staying grounded is all about the people you surround yourself with. I feel very lucky to have loyal friends and colleagues. It's about finding a group that's honest but kind, and truly have your back. I come from a very loving and supportive family and I don’t think I could have survived this business without them. I speak to my parents and my sister several times a day. I think having Rodger as my husband for 20 years and co-CEO is really helpful in keeping me normal in a very abnormal business. What is the hardest thing about raising kids in Los Angeles? In Los Angeles, specifically, I feel that we are constantly conflicted about natural versus traditional medicine. I fall somewhere in between. When it comes to the approach to treating an illness, do you turn to Tylenol or don't you? For the most part, LA is conducive to natural healing which I strongly believe in but I think it's all about finding a balance that works for you. A constant challenge is trying to keep your children grounded in reality because raising children here can sometimes feel like the land of make believe. It's important that your children understand that there is so much more out there to see and experience. Also, teaching our boys empathy and sympathy are always a priority for us. What are some of your most loved ways to spend the day with your clan? Between my work schedule and the boys' school and activity schedule, it's so nice to have weekends free. We love to go to the farmer's market, have brunch, go for frozen yogurt and just relax together -- family pizza and movie nights are just the best. The kids are like a standup comedy act all day, everyday. I wish I could record them they are so entertaining. Sometimes, I think they are smarter than me at age 4 and 6, than I was in my early 20's. I'm constantly amazed by the adult conversations they have and what they know about the world. They are constantly teaching me about plants and animals - and most importantly they have already developed empathy at such a young age. The worst thing to hear is that you absolutely have to breastfeed for the health of your child. I did breastfeed both of my children, but people need to be sensitive and understand that it can be a struggle for a lot of moms and its okay if you don't. The pressure shouldn't come from other people about what to do and for how long. Also I found that people were telling me that my body would never be the same, when in reality, I was in better shape after having kids than I ever was before. The best thing I heard and what really resonated with me was that having a boy is like an indescribable love affair between a mother and son, which is completely true. I never knew that I could love a man this much...different from the love I have for my husband. It seems too obvious but the actual pain of giving birth is unfathomable. The best thing is the indescribable feeling of holding your child in your arms for the first time, it really is an out of body experience. The best and the worst parts of labor happen in the same 5 minute period. A lot of times people tell you that having a child doesn't entirely change your life, but it really does, in every way, and it's something you just can't prepare for. No one tells you that everything you do is for your children, and your sole purpose in life if their happiness and well-being. Your life is forever changed, but in the best way possible. When I was young I never liked to commit to things. I imagined that I wouldn't be married and that I would grow up to be a psychologist. Cut to 20 years of marriage, and my life becoming much more about work than I thought that it would. I never thought my job would be something that I genuinely loved. I didn't know anyone that truly lived for their work. To have passion for your career is a gift I do not take for granted. I learned something valuable from my sister, who is a heroic single mother of 2: to pick your battles with your children. For me, it's how my children are to other people. It's a priority for us to teach them to always be kind, to have manners, and to have sympathy and empathy for others. Rodger and I feel very strongly that children are born a certain way and the rest is up to the parents. As an adult, my passion is all about living a life that feels full. It can be a challenge when you are overwhelmed with work, but I try to really take in all of my experiences and remind myself to be grateful. If anything, Rodger and I have gotten closer because now we share the most important thing in life. I have to remind myself though to make Rodger a priority as it's easy to always put the kids first. But I do tell Rodger, "you had me alone for 18 yours, now its their turn." Always surround yourself with good people, you're only as good the company you keep in both your personal and professional life. I couldn't have grown my career without my supportive team or my husband by my side. Coming up in my career I missed out on a lot of things, like birthdays and weddings because I was so consumed with work. As I have gotten older, I realize it's important to stop and smell the roses. Enjoy your youth! Don't take life so seriously because things will only get harder. Our full time job is keeping our children healthy and safe. Something my mother pointed out before I had my own children is that you worry about them for the rest of their life. You don't breathe the same way, it's a worry that will never go away and that you will always carry with you. That life is not always fair, and there is a huge world outside of their own that is really complicated and hard. My boys have a very healthy curiosity about the world and I hope that is something they never grow out of. Enjoy every minute because it goes by so quickly. Someone told me that when I first had children so that's why I have always made a point to be home for the precious moments like dinners and bath time. Also, don't raise your children the way you think you're supposed to - because that's how you were raised or that's how your friends raise their children. Pick and choose what works for you. Baby wipes, sanitizer, organic oils like calendula and arnica, organic foods and Amazon!